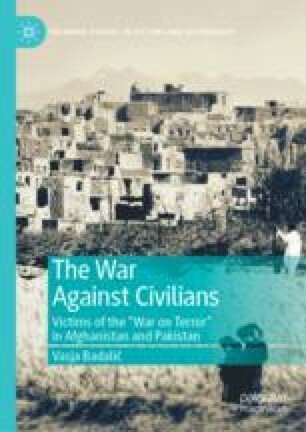 This chapter explores the impact of U.S. drone strikes on civilians in Afghanistan and Pakistan. The first section of the chapter examines three too-broad target selection criteria that led to drone strikes targeting civilians (e.g., adult males standing in proximity of known combatants, first responders who rushed to the site of a drone strike, individuals regularly communicating with known combatants). The second section examines two technical factors behind imprecise strikes (e.g., low quality of video footage), while the third section shows how malicious human behavior undermined the precision of the strikes (e.g., informers providing faulty intelligence). The last, fourth section of the chapter shows how the too-broad criteria for determining targets necessarily led to indiscriminate attacks against civilians. Abbot, Sebastian. 2012. “New Light on Drone War’s Death Toll.” Associated Press, February 26. http://news.yahoo.com/ap-impact-light-drone-wars-death-toll-150321926.html. Accessed on 28 February 2017. Ali, Yousaf. 2006. “Most Bajaur Victims Were Under 20.” The News, November 5. https://www.thenews.com.pk/archive/print/646502-most-bajaur-victims-were-under-20. Accessed on 12 February 2017. Alston, Philip. 2010. Report of the Special Rapporteur on Extrajudicial, Summary, or Arbitrary Executions: Study on Targeted Killings. Geneva: UN Human Rights Council. http://www2.ohchr.org/english/bodies/hrcouncil/docs/14session/A.HRC.14.24.Add6.pdf. Accessed on 12 March 2016. Clark, Kate. 2011. The Takhar Attack: Targeted Killings and the Parallel Worlds of US Intelligence in Afghanistan. Kabul: Afghanistan Analyst Network. http://www.afghanistan-analysts.org/wp-content/uploads/downloads/2012/10/20110511KClark_Takhar-attack_final.pdf. Accessed on 20 April 2017. Cloud, David S. 2011. “Anatomy of an Afghan War Tragedy.” Los Angeles Times, April 10. http://articles.latimes.com/print/2011/apr/10/world/la-fg-afghanistan-drone-20110410. Accessed on 16 April 2017. Dryer, Alexandre. 2006. “How the NSA Does ‘Social Network Analysis’.” Slate, May 15. http://www.slate.com/articles/news_and_politics/explainer/2006/05/how_the_nsa_does_social_network_analysis.html. Accessed on 12 February 2017. Farooq, Umar, and Syed Fakhar Kakakhel. 2014. “Obama’s Deadly Informants: The Drone Spotters of Pakistan.” The Daily Beast, November 14. http://www.thedailybeast.com/articles/2014/11/12/obama-s-deadly-informants-the-drone-spotters-of-pakistan.html. Accessed on 20 April 2017. Filkins, Dexter. 2011. “The Journalist and the Spies.” The New Yorker, September 19. http://www.newyorker.com/magazine/2011/09/19/the-journalist-and-the-spies. Accessed on 28 April 2017. Gall, Carlotta, and Ismail Khan. 2006. “American Strike in January Missed Al Qaeda’s No. 2 by a Few Hours.” The New York Times, November 10. http://www.nytimes.com/2006/11/10/world/asia/10pakistan.html?pagewanted=all. Accessed on 25 April 2017. HRC (Human Rights Clinic) and Civic (Center for Civilians in Conflict). 2012. The Civilian Impact of Drones: Unexamined Costs, Unanswered Questions. New York: Colombia Law School and Civic. http://web.law.columbia.edu/sites/default/files/microsites/human-rights-institute/files/The%20Civilian%20Impact%20of%20Drones.pdf. Accessed on 20 April 2017. ICRC (International Committee of Red Cross). 2010. Additional Protocols to the Geneva Conventions of 12 August 1949. Geneva: International Committee of the Red Cross. https://www.icrc.org/eng/assets/files/other/icrc_002_0321.pdf. Accessed on 14 April 2017. IHRCRC (International Human Rights and Conflict Resolution Clinic), and GJC (Global Justice Clinic). 2012. Living Under Drones: Death, Injury, and Trauma to Civilians from US Drone Practices in Pakistan. New York: Stanford Law School, NYU School of Law. http://chrgj.org/wp-content/uploads/2012/10/Living-Under-Drones.pdf. Accessed on 8 May 2017. Kazim, Hasnain. 2013. “Drone Attacks are the Right Thing to Do.” Spiegel Online, December 14. http://www.spiegel.de/international/zeitgeist/interview-pakistani-cia-informant-on-drone-warfare-and-taliban-a-937045.html. Accessed on 30 April 2017. Lewis, Larry. 2014. Improving Lethal Action: Learning and Adapting in US Counterterrorism Operations. CNA Analysis & Solutions. https://www.cna.org/CNA_files/PDF/COP-2014-U-008746-Final.pdf. Accessed on 5 April 2017. Linebaugh, Heather. 2013. “I Worked on the US Drone Program. The Public Should Know What Really Goes on.” The Guardian, December 29. http://www.theguardian.com/commentisfree/2013/dec/29/drones-us-military Accessed on 11 April 2016. Mayer, Jane. 2009. “The Predator War: What Are the Risks of the CIA’s Covert Drone Program?” The New Yorker, October 26. http://www.newyorker.com/reporting/2009/10/26/091026fa_fact_mayer. Accessed on 6 June 2016. McKelvey, Tara. 2012. A Former Ambassador to Pakistan Speaks Out. The Daily Beast, November 20. http://www.thedailybeast.com/articles/2012/11/20/a-former-ambassador-to-pakistan-speaks-out.html. Accessed on 5 April 2017. Porter, Gareth. 2011. “How McChrystal and Petraeus Built an Indiscriminate ‘Killing Machine’.” Truthout, September 11. http://www.truth-out.org/news/item/3588:how-mcchrystal-and-petraeus-built-an-indiscriminate-killing-machine. Accessed on 4 April 2016. Radio Transmissions and Intercom. 2010. http://www.scribd.com/doc/52825019/Transcripts-of-Drone-Attack. Accessed on 4 April 2017. Shah, Naureen. 2013. Civilian Harm from Drone Strikes Assessing Limitations & Responding to Harm. New York: Colombia Law School. https://cpc-grijalva.house.gov/uploads/Naureen%20Shah%20DronesHearingWrittenTestimony1.pdf. Accessed on 11 April 2016. Smith, Josh. 2016. “Afghan Drone War: Data Show Unmanned Flights Dominate Air Campaign.” Reuters, April 20. http://www.reuters.com/article/us-afghanistan-drones-exclusive-idUSKCN0XH2UZ. Accessed on 11 April 2016. Stanikzai, Zainullah. 2016. “17 Security Personnel Among 32 Killed in Helmand Raids.” Pajhwok, August 27. http://www.pajhwok.com/en/2016/08/27/17-security-personnel-among-32-killed-helmand-raids. Accessed on 26 April 2017. TBIJ (The Bureau of Investigative Journalism). 2011a. “The Bush Years: Pakistan Strikes 2004–2009.” London: TBIJ. https://www.thebureauinvestigates.com/2011/08/10/the-bush-years-2004-2009/. Accessed on 16 February 2017. ———. 2011b. “Pakistan: Reported US Strikes in 2010.” London: TBIJ. https://www.thebureauinvestigates.com/drone-war/data/obama-2010-pakistan-strikes. Accessed on 12 February 2017. ———. 2016. “Afghanistan: Reported US Air and Drone Strikes 2016.” London: TBIJ. https://www.thebureauinvestigates.com/drone-war/data/get-the-data-a-list-of-us-air-and-drone-strikes-afghanistan-2016. Accessed on 12 February 2017. ———. 2018. “CIA and US Military Drone Strikes in Pakistan, 2004 to Present.” London: TBIJ. https://docs.google.com/spreadsheets/d/1NAfjFonM-Tn7fziqiv33HlGt09wgLZDSCP-BQaux51w/edit#gid=694046452. Accessed on 24 March 2019. Wheeler, Winslow. 2012. “Finding the Right Targets.” Time, February 29. http://nation.time.com/2012/02/29/3-finding-the-right-targets/. Accessed on 16 April 2017. Williams, Brian Glyn. 2013. “New Light on CIA ‘Double Tap’ Drone Strike on Taliban ‘First Responders’ in Pakistan’s Tribal Areas.” Perspectives on Terrorism 7 (3). http://www.terrorismanalysts.com/pt/index.php/pot/article/view/269/html. Accessed on 5 May 2017. Woods, Chris, and Christina Lamb. 2012. “CIA Tactics in Pakistan Include Targeting Rescuers and Funerals.” The Bureau of Investigative Journalism, February 4. http://www.thebureauinvestigates.com/2012/02/04/obama-terror-drones-cia-tactics-in-pakistan-include-targeting-rescuers-and-funerals/ Accessed on 6 June 2016. Woods, Chris, and Mushtaq Yusufzai. 2013. “Bureau Investigation Finds Fresh Evidence of CIA Drone Strikes on Rescuers.” The Bureau of Investigative Journalism, August 1. http://www.thebureauinvestigates.com/2013/08/01/bureau-investigation-finds-fresh-evidence-of-cia-drone-strikes-on-rescuers/. Accessed on 6 June 2016.